Briercliffe Sergeant Succumbs To Pneumonia Four Days After Arrival Home. Mrs. Bullock and family, of Granville street, Briercliffe, have suffered a sad blow this week by the death of Sergt. Richard Bullock, who returned home on Saturday last after serving in France from February 1917 to that time, with a break which he was wounded at Paschendale Ridge. He was suffering from a cold when he arrived home, and took to bed on Sunday, and Dr. Donaldson was called on Monday. However, acute pleurisy had set in, followed by pneumonia, and he passed away on Tuesday morning. Sergt. Bullock, who was 32 years old, spent the first 22 years of his life at Brierfield, and was well known in sporting circles, being a member of the old Brierfield Cycling Club, and of the Brierfield Swifts Football Club. While at Brierfield he was a weaver at Whitehead's Mill. He was a keen homing fancier. Below is a copy of a congratulatory message received by him from his Brigadier-General:-"The Major-General, 4th Division, has received a report of the good work and devotion to duty of 242048, Corpl. (since made Sergt.) R. Bullock, 1st King's Own (R.L.) Regt., and he wishes to congratulate him on his fine behaviour." 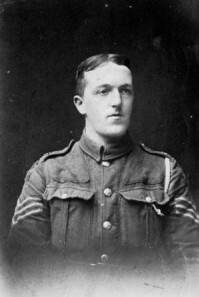 Prior to joining up in April, 1916, Sergt. Bullock was a weaver at Walshaw Mill. The internment takes place to-day (Saturday) at Wheatley Lane. With thanks to Andrew at Burnley in the Great War for the main image.